Reliable, powerful and efficient, this 320 GPH Fountain Pump offers easy to adjust pump volume settings and is oil-free and environmentally safe! Angelo Dicor offers a one year limited warranty on all pumps. Warranty does not cover damage caused by environmental factors or neglect. Algreen's Versatile magnetic drive pumps are ideal for any job. These energy efficient pumps are U.L listed with a 1 year warranty. 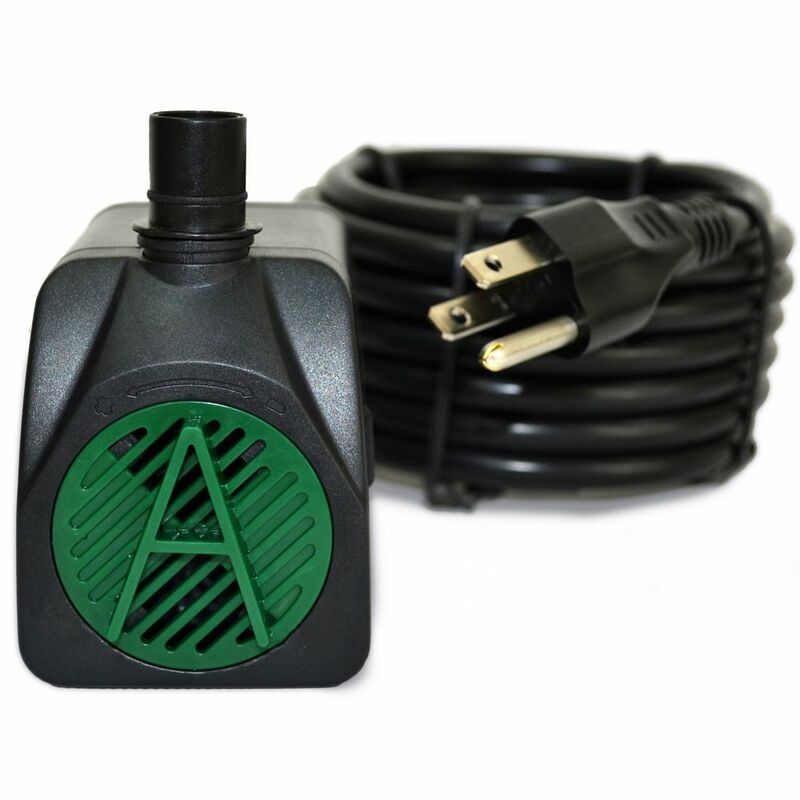 Perfect for Hydroponics and Fountains. Algreen's CrystalFlo Pump with Pond Filter & UV Clarifier is an all-in-one unit that maintains cleanliness in your water garden. The CrystalFlo has both Mechanical and Biological filters as well as a UV light to Kill Floating Algae. This unit is fully submersible and features a ball joint to level the fountain heads. Ideal for water depths ranging from 6 to 14 in. Suitable for container water gardens and small decorative ponds. Kit includes: 100 GPH energy efficient pump, Pre-Filter, 1/2" Output and Adapter, Diverter with flow control, Telescoping Extension Tube, 3 Spray Nozzles: Bell, Tiered and Trumpet. Create a stunning water feature with ease with this powerful 1000 gallon per hour pond pump. Engineered for quiet, powerful and reliable operation, this pump is designed specifically for pond use. Compatibility with most pond applications and equipment. 320 GPH Fountain Pump Reliable, powerful and efficient, this 320 GPH Fountain Pump offers easy to adjust pump volume settings and is oil-free and environmentally safe!